"We went to Harlan County between seasons one and two," Elmore said. "We got a tour of Woodford Reserve. We learned about the distillation process. It really hit us. We felt very culturally ingrained." I wonder if it's coincidence: for me, "Justified" took a big leap in quality between seasons 1 and 2. Was it the Bourbon? "I've always been a huge Black Maple Hill fan," Elmore said. "After work a couple days a week, we'd have a couple glasses of Bourbon. That became a big hit. From there, people drank a lot more Bourbon. I'm seeing it in a lot more offices. We're all big Bourbon snobs on the show now. We know a little bit about what kind of palate these guys would have." 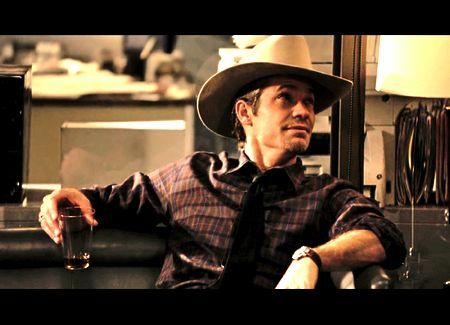 Elmore said that "Justified" does have some product placements (see update below), such as the fact that the main character, Raylan Givens, is drinking Ancient Age this year. But that's also a character decision, to show that Givens is living a cheaper lifestyle. Buffalo Trace distillery, which makes Ancient Age and is paying for the product placement, also makes higher-end Blanton's, Eagle Rare, Elmer T. Lee and Pappy Van Winkle. UPDATE: I got an email from Amy Preske, public relations manager for Buffalo Trace, who says, "I wanted to let you know that we (Buffalo Trace Distillery) does NOT pay for product placement on Justified, nor have we ever. I personally have worked with the show’s producer to send him most of those bottles that you mentioned, (with no fee exchanged) as well as even some empty cases and bar equipment so they could make some of their bars look realistic." Buffalo Trace products are not the only Bourbons shown. 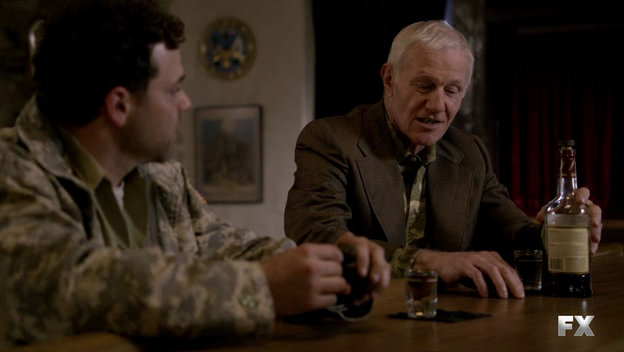 Arlo Givens, Raylan's no-good father, drinks Wild Turkey, and so has Raylan. "Raylan will pretty much drink whatever's in front of him," Elmore says. "He'll have a premium Bourbon on a special occasion." Villains are often known by their drinks. Last year's bad guy, Robert Quarles, always ordered the most expensive Bourbon in the house. This year, hitman for hire Colton Rhodes drinks beer. "He's from out of town," Elmore says. "He's not part of this world." I asked if the distilleries were bothered by having criminals drink their brands, and Elmore said, "Most of the liquor manufacturers are just happy to have a scene on television." The bottles are real, but the brown liquid is not. "It's usually tea or colored water," Elmore said. "There are insurance issues." I asked what the cast drinks. 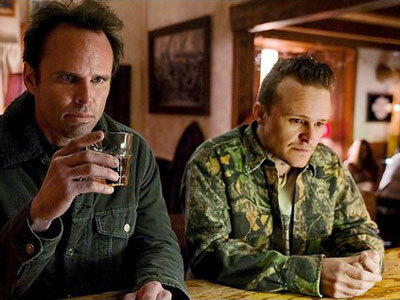 Walton Goggins, who plays Boyd Crowder, is a Maker's Mark fan, Elmore says. "Walton will put back some Bourbon," he says. Nick Searcy, who plays Raylan's boss Art, is the biggest aficionado in the cast and prefers a sip of Elmer T. Lee at the end of the day -- pretty much just like his character. Elmore says he drinks Bourbon almost exclusively neat. "Once in a while I'll add a little ice," he says. "I'll usually drink Knob Creek with a little ice. There's not a lot of Scotch or Irish whiskey going on on our set. Bourbon is it." Justified airs Tuesday nights on FX, but if you haven't seen it, go back to the beginning and rent or buy the whole thing. Season 1 is decent; it really takes off in season 2. And get a bottle of Bourbon ready; the show makes me thirsty for it. Between this show and the Manhattans and Old Fashioneds on Mad Men, my bourbon consumption is at an all time high. And I couldn't be happier. Knob Creek is great, but to borrow a wine term, my daily drinker is Bulleit's (they make a great Rye I've recommended on this blog as well).